“This is it! I finally found my perfect foundation.” It’s kind of like finding the right man. I mean, it’s called foundation. It’s a makeup element that important…that crucial to beauty…to life. But just like dating, we so often think we found “the one” when we find out later it’s not as perfect as we once thought. You know you’re so into it at first when it’s fresh, but then a couple weeks later you’re over it… and maybe it’s breaking you out. 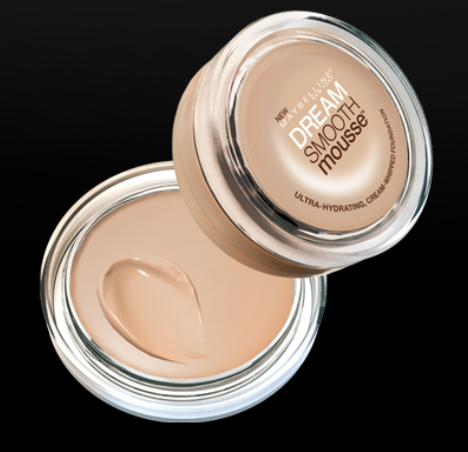 Dream Smooth Mousse for acne and spot coverage. SMOOTH is the key word…not the matte variety. Mousse foundation. I outgrew it, just like I outgrew my high school crush. My skin is no longer plagued by red, acne marks so it doesn’t need a heavy, mask-like coverage anymore. However, girls, if you’re suffering from acne right now, use this! Don’t feel weird about putting a drugstore brand foundation on your face. I’ve tried so many expensive foundations and always went back to this. It never made me breakout and it erases flaws. I still use it under my *new* foundation as a concealer for a few problem spots. Okay, it’s time for me to reveal the ***holy grail*** of foundation. It’s……Sephora’s Perfection Mist Airbrush Foundation. I bought this $26 foundation about six weeks ago. I closed my eyes and sprayed it on, then I opened my eyes…giggled… and then covered my mouth with my hand in amazement. It looked like I just sprayed an Instagram perfecting filter on my face. I ran into the other room to show off my skin to my sister. It’s truly an airbrush. Estee’ Lauder has a version about $40 more expensive, but don’t even dabble. It doesn’t get better than Sephora’s variety. It gives solid coverage and makes you look poreless. Put a light layer of Make Up Forever’s HD Finishing Powder on top and WHALA! FLAWLESS skin. (If you don’t already have Make Up Forever’s HD Finishing Powder, I don’t even know what to do with you. *SMH*) I even got a darker shade of the mist foundation in addition to my medium shade for contouring. *Final Tip* I put a sleeping mask on when I spray so that my eyelashes and brows don’t turn beige. I used to the think $25 dollars was too much for foundation but then I started using Studio Gear. I may need to try out this Sephora. Ooh yes I agree, the Sephora Airbrush foundation is great! Hi! I just have to thank you for this post. I don’t live near a Sephora but do live near many a CVS. I found Maybelline’s Dream Matte Mousse (they don’t have the “Smooth” variety) and bought it based on your opinion. I. Love. It. As one with perpetually troubled skin, I very much need a full coverage foundation. This did the trick. Can’t thank you enough! Ashley, I loved watching you on the Bachelor! You were my fave! I saw you on Michelle Money’s interview and was so excited to check out your blog. I just bought the Maybelline smooth mousse and it’s AWESOME. I want to get the Sephora airbrush foundation next time I’m near one so I can see what color I need. 🙂 I’m loving your tips bc I feel like we have really similar skin. Plus you always looked gorgeous, so I know I can trust your tips! THANKS! I also hope you are on Bachelor in Paradise when it comes on! Wishing you the best.